Some refer to 4 D's in which the 4th D is death if the condition is not managed. The following pictures show the symptoms of pellagra. 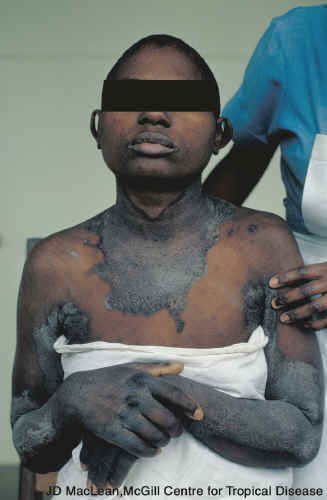 The link below shows another picture of a person suffering from dermatitis as a result of pellagra. Dietary niacin toxicity is rare. However, nicotinic acid (not nicotinamide) can improve people's lipid profiles when consumed at levels far above the RDA. For instance the RDA & upper limit (UL) is 14 or 16 (women & men) and 35 mg (both), respectively. Many people are taking 1-2 grams (up to 6 g/day) to get the benefits in their plasma lipid profiles as shown in the table below4,5. It should be pointed out that there are special supplements for this purpose that include a slower release nicotinic acid that helps prevent the toxicity symptoms (nicotinamide is not toxic). A slow (aka long or extended) release form of niacin for people with atherosclerosis is Niaspan®. The link below is to Niaspan’s site. A study found that Niaspan plus a statin was no better than a statin alone in preventing heart attacks, despite improvements in HDL and triglyceride levels. This result challenged the understanding of the importance of HDL and triglyceride levels to heart attack risk. The link below explains this study’s results. A nicotinic acid receptor GPR109A, which is present in adipocytes and immune cells, has been believed to mediate niacin flush, but the beneficial effects on lipid profiles do not appear to be mediated by this receptor7,8. It is not clear at this time the mechanism of action for the improvements in lipid profiles7. Gille A, Bodor E, Ahmed K, Offermanns S. (2008) Nicotinic acid: Pharmacological effects and mechanisms of action. Annu Rev Pharmacol Toxicol 48: 79-106. Ginsberg HN, Reyes-Soffer G.. (2013) Niacin: A long history, but a questionable future. Curr Opin Lipidol. 24: 475-479. Liu D, Wang X, Kong L, Chen Z. (2015) Nicotinic acid regulates glucose and lipid metabolism through lipid-independent pathways. Curr Pharm Biotechnol. 16: 3-10.